by Angel Playing Card Manufacturing Co. Ltd.
Measurements: 2.5 x 4.45 inches, or 64 x 114 mm. Booklet included: Yes, 57 pages, 2.3 x 4.35 inches, or 58 x 111 mm. Text by Stuart R. Kaplan. Publisher: US Games. Printed in Japan. 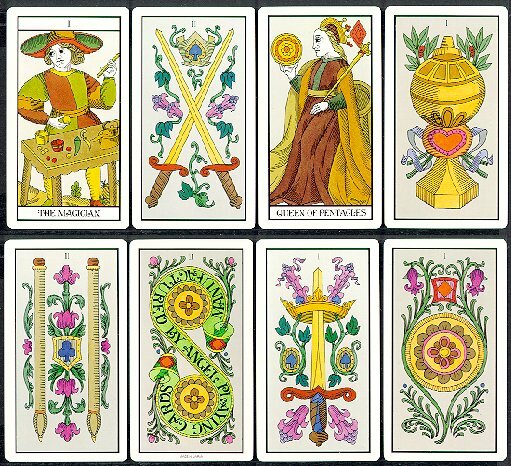 Comments: This is one of the first complete tarot decks to appear from Japan (around 1980) & is based on a number of traditional western designs. The coloring is intended to suggest "medieval" tones, or I presume what folks thought medieval colors to look like. There is some particular order to the cards as packaged, starting with the Two of Pentacles. If this is of interest, unwrap the deck carefully. The original order is given on page 2 of the enclosed booklet. - These notes adapted from those of Stuart R. Kaplan.